Limited Time Only Incentives and New Store Design to Drive Brand’s Growth Across U.S.
CANTON, MA (June 17, 2013) – Baskin-Robbins, the world’s largest chain of ice cream specialty shops, announced today the introduction of unprecedented development incentives in 2013 for new franchisees and military veterans. 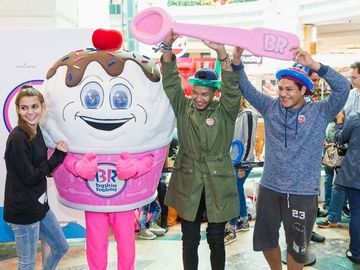 These limited time only incentives, some of the steepest the brand has ever offered, are part of Baskin-Robbins’ growth plans to attract new franchisees and develop with current franchisees through remodels, relocations and expansion. "We believe in our veterans, and we know they make great franchisees for Baskin-Robbins," said Mitchell, a former U.S. Army Captain. 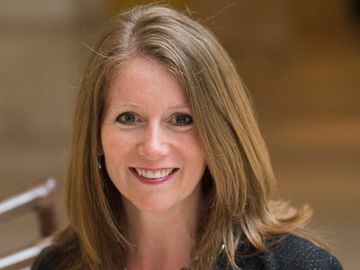 "We are honored to be able to offer our military heroes these incentives, enabling them to own their own business and utilize their leadership experience and training to run a successful ice cream shop." New 2013 incentives for expansion, remodels and relocation also are available for a limited time only to existing Baskin-Robbins franchisees who are certified to grow and meet expansion qualification criteria. Over the course of the next two and a half years, over 300 new and remodeled franchise locations are expected to debut the new U.S. store design, which celebrates the brand's heritage and incorporates modern visual elements. The new design is built around five core elements, including a newly designed menu board system with an LCD screen; eye-catching ice cream “supergraphic” artwork; a wall that highlights the brand’s legacy of flavors; an updated brand logo; and whimsical pink spoon accents, including spoon-shaped door handles. With a business system that combines delicious treats with a simple operating model, Baskin-Robbins continues to attract entrepreneurs in target markets such as California, Florida and Texas to enable the brand’s expansion. In 1945, Baskin-Robbins was founded by two ice cream enthusiasts who shared a dream to create an innovative ice cream shop that would be a neighborhood gathering place for families. Today, over 300 million people visit Baskin-Robbins each year to sample from the more than 1,000 flavor creations available in its ice cream library. 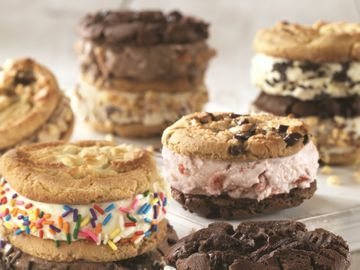 Baskin-Robbins offers guests its wide range of hard scoop ice cream flavors, along with custom ice cream cakes, delicious frozen beverages, premium soft serve and take home frozen treats. * For details, please see the Baskin-Robbins Franchise Disclosure Document.